A wise person said to me recently: "You have a product, but you don't have a business." What she meant was that I might be making cool stuff and know cool stuff, and have mad cool skillz, but unless I do the nitty-gritty of the business side - the marketing, the accounting, the strategic planning - no-one will know about my coolness and ask me to do stuff for them. So in a tiny teensy first step I am making an effort to promote myself more. In that spirit, a small announcement: I now have a Tumblr blog. If you want to see my drawing efforts (I promise I will only post the good stuff), go here. In related news, you can still find the best of my film work on YouTube, my still photography on Flickr, and an overview of my other work, including writing samples, on my website. Caravan (caramel/vanilla) milkshakes at Fidel's, a heady mix of indulgence and cool hipsterdom at the top of Cuba Street. Watching the trendy boys skateboarding down the street, the op-shop-dressed girls flaunting their tattoos and piercings. Flat Whites at Felix, and any of the other cafes sprinkled liberally across a town where Starbucks thankfully can't get a grip. There always seems to be a fern leaf cocoa-ed onto the milk foam, and sometimes there is a chocolate fish (or fush). Blue sky, blue water, the promise of penguins and dolphins in the bay, a stretch of sea put to good use: swimming, sailing, canoeing, and a matchless view to the far mountains thrown in. You can't beat Wellington on a good day. 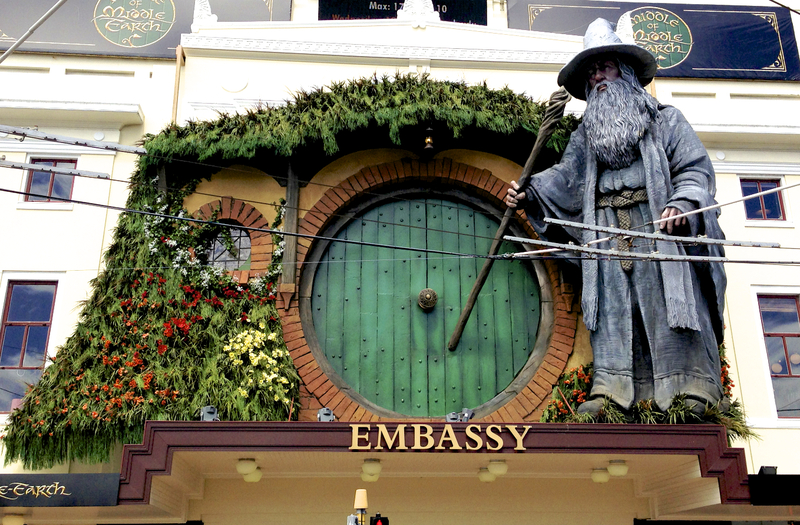 Hobbit obsession taken to another level: an overused Gandalf welcoming visitors to the cinema, dwarves scrambling across the roof of the post office headquarters, hobbits plastered on placards, an invitation to orcs, trolls and wizards at the local bank. Corn fritters, all hot and chewy, with sweet chilli sauce and a pile of fresh green salad. Only one amongst many superb New Zealand Sunday brunch choices, with pancakes, eggs Benedict, full English, burritos - the best breakfast ideas from around the world, handily collected in one menu. The Tui - a bird with a song like a broken gramophone, a beautiful tune ending in a horrid screech. Christmas in summer; I am a grinch, but Christmas on the beach, with barbies and sun, swimming and ice cream, that's a Christmas idea I can get behind. Three degrees of separation - Everyone seems to know everyone else, or is friends with a mate of a cousin of a colleague of everyone else. It makes for easy connections, for mutual help, a common purpose. It makes for nosy neighbours, too, I expect. Dogs barking, car horns tooting, horses' hooves clip-clopping on tarmac, the whistle of the traffic police. Cairo is Cairo, ever noisy, ever hazy, ever warm. Underneath the easily distinguished high notes lies the bass line: the steady stream of car engines, the wailing of traditional music, the bumpy beat of Arab-pop from the brightly lit barges on the Nile below our hotel window. Cutting though the haze over the water the orange streetlights, decorative strings of fairy lights in blue, red, white, purple and green pulse with an inner rhythm. Reflections of hotel up-lighters shimmer on the rippled water surface below concrete facades topped by the names of hotel chains (Sofitel, Novotel, Four Seasons) and iconic penthouse restaurants. It is a pleasure to be stepping out of the air-conditioned airport arrivals hall into the sewage scented, heavy air, into my spiritual home - as Stuart calls it. "What is it about Arab countries that you like so much?" he asks me as the taxi weaves drunkenly between motorbikes, trucks and bashed-up cars through the dark streets. It's dark, yes, it's 9pm already, but wherever there is a flash of light there is colour: neon strips lighting fruit piled high on low tables, lurid packets of cheap goods teetering by the side of a tiny shop, car mechanic workshops, magazine and cold drink sellers. There are people talking by the side of the road, women walking arm in arm, some with and some without headscarves; there are broken down cars in the middle lane, some blokes gathered around peering into the engine bay, hazard lights flashing; there is washing hanging from rickety lines below high windows set into crumbling walls; heroic wall paintings depicting pharaohs marching with revolutionaries, a spray painted slogan: No to SCAF (the dictator-era military council); a medieval citadel rubs up next to a 60s brutalist housing development, ancient walls looming over water-stained wrecks. There is chaos and there is life. I have been feeling dull, leaving first Brighton yesterday and today London. But then the plane descended into Cairo, the city laid out in orange lights under a misty night sky. Busy and calm at the same time, there is so far no indication of unrest, of demonstrations, of protest. I am suddenly gripped by a great interest in finding out how people here feel, how they think of what is going on in their country, how they see the future.